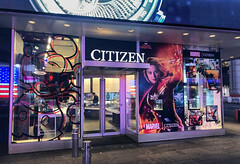 40 VISUALS recently printed and installed some backlit dye-sub fabric for the Citizen Watch store at Times Square in New York City. 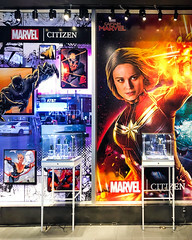 The SEG fabric graphics were displayed in Frameless SEG Light Boxes that were hung from the ceiling all over the store, including the window storefront where shoppers could see the illuminated graphics from the street. Times Square in New York City is known for its abundance of signage imagery. Everywhere you look there are illuminated visuals trying to grab your attention. 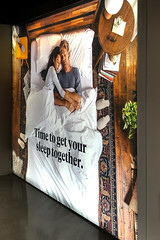 Backlit SEG fabric is definitely playing a part in that, as it’s being used by many major brands and retailers. 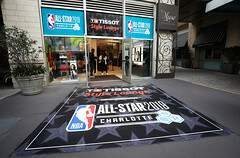 SEG backlit fabric is steadily replacing traditional duratrans as the preferred type of backlit signage. 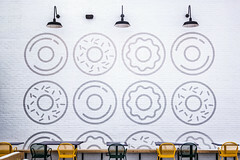 The premium weave fabric was printed by 40 VISUALS using a direct (newest generation) dye-sublimation process and color calibrated by Yellowcase. As you can see from the pictures, the color looks amazing when lit from behind. 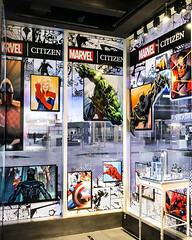 If you are interested in Frameless Light boxes or SEG Backlit Fabric printing give us a shout we’d love to help you get noticed! 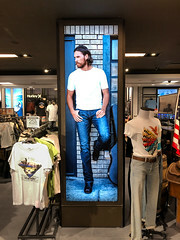 For more information on SEG Backlit Fabric & Frameless Light Boxes please contact us by calling 800-962-3119, or for pricing click the link above.